New York – The famous rock star musician, Marilyn Manson, was visiting NYC and performing a concert in a large concert ballroom when an object fell and hit him. The injured Manson explained that he suffered a head injury as well as a leg injury during the accident. Organizers say that the injuries occurred when a large, heavy stage prop fell from an unknown height onto the man below. He then fell backward onto the ground and possibly hit his head at that point. There is no indication whether or not Mr. Manson lost consciousness. The prop had been suspended by workers before the show onto a tall metal scaffolding column but then fell over and collapsed during the concert. He suffered broken bones from the falling object, including a fracture of his fibula in his leg, and required surgery. He was taken to the hospital by ambulance and stabilized in the emergency room before being taken to the operating room. Hospital surgeons had to repair the leg fracture with metal hardware, leaving him disabled from the accident and unable to work. Representatives for the musician noted that he will undergo additional medical treatment such as physical therapy and possibly occupational therapy. They hope that he will be able to return to work despite having had to postpone many upcoming concerts. Further details about this fall injury are available here. New York – This car crash involved two taxis that collided after one of the drivers apparently ran through a red light. Witnesses of the red light accident explained that one of the vehicles, a minivan, T-boned the car, causing that second vehicle to jump the curb. After running onto the sidewalk, it crashed into pedestrians who were eating in a restaurant’s outdoor seating area. One of the accident victims was a baby who was thrown from his stroller and fell to the ground. He suffered a leg injury with suspected broken bone. Several additional injury victims were passengers in one of the cabs. The young child was the most seriously injured in this sidewalk accident according to authorities. It should be noted that the taxi driver that allegedly caused the collision can face both criminal charges for running a red light and reckless driving as well as civil personal injury lawsuits. Community activists expressed concern about dangerous drivers who operate taxis. They note that close training, licensing and monitoring of these drivers is essential to prevent injuries and wrongful death. Only three weeks ago another young child was struck and killed by an unlicensed cab driver in Rockland, NY. Activists demand answers and changes to prevent additional pedestrian accidents like this in the future. You can find out more about this taxi versus pedestrian collision here. New York – Fire department rescue teams were sent racing to the scene of a construction accident in Manhattan according to reports. Witnesses say that an injured worker had to be extricated from an Upper East Side subway tunnel that was being built for the Second Avenue subway line. Officials explain that the worker suffered a leg injury when a heavy piece of equipment fell on him after breaking loose. He was unable to move on his own due to the seriousness of the accident injuries and a crane was used to lower firefighters down to help. Rescue teams began treating his wounds while he was lifted out of the construction site and transported to an emergency trauma room of a nearby hospital. The cause of the construction injury is still unclear and investigators were looking into why the object fell on the worker. Work safety activists say that it is important for employers to provide proper training and safety gear to their employees. It is also necessary to secure machines and equipment properly in order to avoid work accidents. Investigators will need to determine if all applicable laws and regulations regarding safe work site practices were being observed at the time of the accident. To find out more about this subway accident and work injury, check out this article. New York – A workman and two pedestrians were injured on a Midtown Manhattan sidewalk this past Thursday. The wounded victims were hit by large broken pieces of a glass window that crashed down from an office building above. According to investigators, it all started with a construction accident inside the building that was undergoing renovation work at the time. Workers were hard at work when either a piece of machinery or scaffolding apparently crashed into the window, cracking it and sending heavy chunks of glass slamming onto the sidewalk below. One of the injury victims was a worker who was taken to the hospital for treatment of an unknown leg injury. At least one of the injured bystanders had suffered a head injury according to witnesses of the pedestrian accident. She was also taken by ambulance to the trauma department of a nearby emergency room for emergency treatment. Public safety advocates have explained that the accident requires further investigation to determine if all necessary precautions were taken by the construction company to ensure the safety of the area. This includes worker safety to prevent a work injury as well as an accident that endangers the health and lives of bystanders. Officials say that laws and regulations are in place to prevent injuries and deaths from these types of preventable accidents. However, some have complained that workers and employers take dangerous shortcuts all too often, leaving innocent civilians at risk for serious injuries or wrongful death. Some activists report that particular construction bosses and workers have been guilty of outright negligence that led to an accident. It usually falls upon the buildings department and agencies such as OSHA to monitor worksites and prevent these types of accidents. See more about this construction injury here. New York – A pedestrian accident left two women with severe injuries after they were hit by a bus in Manhattan. The bus crash occurred when the women were crossing the intersection of 47th Street and 10th Avenue in Midtown. The bus driver was turning left onto the side street and apparently had a green light according to witnesses. However, pedestrians crossing at a crosswalk usually have the right-of-way over motor vehicle traffic. The bus struck the pedestrians and left one of the women crushed under a back wheel of the vehicle. The other accident victim was thrown to the ground after being hit and suffered a leg injury. Emergency crews rapidly responded to the scene of the collision and had to extricate the trapped victim from under the tire. Police explain that the bus was owned and operated by a private transportation company. They were continuing their investigation into the cause of the bus accident and the safety record of the bus company. Reports also show that a second, unrelated bus crash occurred only four days later, this time in Brooklyn, NY. That bus was operated by the Metropolitan Transportation Authority (MTA), who issued a statement that the cause of the accident was actually the bicycle rider. Witnesses reported that the bike rider was working as a delivery man when he suddenly pulled out in front of the bus. The bus then crashed into several cars as it apparently swerved. It was unclear if anyone on the bus suffered any accident injuries. An accident lawyer noted that if substantiated, the bicyclist can face charges and a lawsuit for causing a motor vehicle accident. 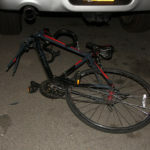 See this article for more details about the bicycle accident. New York – A woman was injured in a construction accident on a busy sidewalk in Manhattan. According to video evidence close to the accident scene, a woman bystander was struck in the leg by a saw blade that had flown off of a piece of construction machinery. It is still unclear how the accident occurred, with some witnesses reporting that the equipment broke while the saw was cutting a section of the roadway. The victim suffered a laceration and leg injury and then fell during the accident. Workers and other bystanders reported that the entire incident took place so quickly that it left everyone in shock. Some activists believe that the accident possibly occurred due to negligence. They attribute the accident and injuries to a combination of negligent maintenance of the machines along with lack of appropriate closing of the sidewalk and street. Officials say that the street was being dug up in order to fix a broken water main. 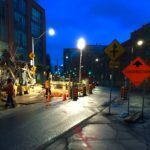 However, safety codes normally say that dangerous construction sites must be sectioned off from pedestrian and vehicle traffic, as necessary, in order to prevent injury or death. Leaving a hazardous condition open to innocent bystanders See more about the work site accident along with a video here. New York – A Broadway show actor was injured at work when his leg was trapped in a piece of stage equipment. The trap door machine mechanism closed on the victim’s foot prematurely and caused the accident. The injured man was rescued from the device when workers cut through the stage set and called for an ambulance. Reports from the ambulance crew show that the accident victim suffered a severe leg injury including broken bones. He was rushed to a nearby trauma center in midtown New York City for evaluation and treatment of his injuries. Co-workers and bystanders expressed concern regarding the safety of the equipment and machines being used on the show. Some pointed out several previous accidents with injuries on the same set since they began work on the show. Previous accidents on the set have included one worker suffering rib fractures, another man sustaining herniated discs and other spinal injuries, a woman who suffered a head injury with concussion and yet another actress who fractured bones in both wrists. The management who run the show insist that human error caused this most recent accident but others believe that equipment malfunction is to blame. Work safety advocates and union members have asked for further investigation into this accident since they believe that more safety precautions need to be set in place. They worry that more accidents and injuries or even deaths are just around the corner if safe practices are not demanded of the employer producer of the show. Proper inspections and maintenance is necessary to keep the machinery in proper working order and to prevent malfunctions. Workplace safety activists warn that this specific show has been the scene of too many accidents and it has come time for the bosses in charge to take safety more seriously. While some may not think of this type of work setting as being a place with dangers and injuries, advocates say that the hazards are real and need to be addressed. More about the injuries and problems with this show can be found here. New York — Transportation safety activists are up in arms this week as two taxi accidents occurred within days of each other on city streets. The most recent of these car crashes involved a cab that jumped onto a busy Manhattan sidewalk and hit several pedestrians. The injured pedestrians included a woman tourist that suffered severe injuries of both legs. One of her feet was amputated during the car accident according to doctors. Bystanders tried treating the injured woman until ambulance crews and paramedics arrived. Unfortunately, trauma surgeons in the hospital were unsuccessful in reattaching the severed foot. According to reports, this cab accident victim was the most seriously wounded during the crash. However, at least two additional injury victims were treated in this pedestrian accident according to emergency responders. The extent of their wounds were unclear and the patients were rushed to the hospital for emergency evaluation and treatment. Witnesses say that the cab driver hit a bicyclist and some report that it was due to road rage. The taxi driver claimed that the accident was due to his losing control after the bicycle rider started banging on his cab. Police investigators were still looking into the details of what caused this motor vehicle crash. Apparently, the taxi driver has a poor driving record with several violations and tickets, including one for running a red light. Safety activists in the city expressed concern since this was not the first alleged road rage accident involving a NYC cab this week. In an unrelated taxi crash, two cab drivers were allegedly fighting for a customer fare and the car jumped the curb, hitting a construction scaffolding. In that taxi accident, one of the cars also hit the side of the building and caused damage. Activists pointed to the reckless driving behavior of many drivers in the city and are demanding more concrete actions to protect citizens. They warn that police and officials must do more to ticket aggressive drivers and suspend their driver’s licenses. Some believe that police should even impound their cars and arrest the most serious offenders, including those convicted of road rage crashes. Otherwise, safety advocates say, we can all expect to continue seeing serious accidents and injuries or even deaths on New York’s roads. You can find out more about the pedestrian accident involving the taxi driver and tourist here.